Insider's Look at Life's Abundance from Life's Abundance on Vimeo. In the past decade or so, most cat owners have become more aware that their cats need a good diet for optimal health. However, most of us have been so inundated with "this brand is better than that brand" by the media and pet food companies that many people are confused as to what constitutes a "good" food. After many years of trying many different brands of food for our dogs and Persian cats, we have found that a "fixed formula" pet food is the best. A fixed formula food is one that no matter what the price of the ingredients, the food is made the same each and every time. Grocery store foods are not made that way. Whatever is cheapest when the pet food company goes to make their food is what is in there the most. Corn is something that many cat foods contain as it is a cheap filler. However, corn is not easily digestible by cats and dogs. Therefore, in my opinion, corn should not be in there at all! Cat and dog food should be a meat based formula. A good, fixed-formula food is essential to good health. As with humans, we are what we eat. It goes without saying that if your cat has a good diet, there may well be less health problems - thus fewer vet costs. In 1999, we came across a company that makes and sells, what I believe to be, the best cat and dog food on the market today! All of their foods are formulated by a nationally-recognized natural veterinarian, Dr. Jane Bicks. Putting a Premium on Pet Health - Intro from Life's Abundance on Vimeo. The secret to superior pet food lies in the formula itself – not only in the ingredients, but also in the proportions of those ingredients to each other. While many cat foods may meet technical standards for dietary requirements, some pet food manufacturers cut corners on their ingredients, which affects the quality of the overall formula. To help you choose the best food for your dear companion, I have identified eight crucial measures upon which all cat foods can be judged. Keep in mind that the food you choose should score well in every category, as does Life's Abundance Premium Health Food for Kitten and adult Cats. Remember, your cat deserves nothing less than the very best. The brand you feed is the most important decision you can make as a pet parent. Because your cat eats the same food every day, it's his primary source of nutrition. And a superior cat food can help to foster a solid nutritional foundation, which can help sustain your cat over a long and healthy lifetime. As a caring pet parent, it's important that you see through marketing ploys designed to mislead you about the quality of ingredients and their intended dietary benefits. Additionally, some competing brands use wheat and wheat glutens, corn and corn glutens, as well as artificial food colors and preservatives. Life's Abundance never has and never will. That's part of their commitment to you and your cat to provide the safest and most innovative nutritional formulas for a better life. While the top five ingredients of a given cat food provide the consumer with insight into the nutritional priorities of a pet food maker, they don't tell the whole story. Every ingredient plays a critical part, which is why Life's Abundance provide a comparison based upon eight different quantitative measures. Furthermore, the secret to superior pet food lies in the formula itself – not only in the ingredients, but also in the proportions of those ingredients to one another. The significance of the ratios cannot be understated. Life's Abundance long-time pet food formulator, Dr. Jane Bicks, stresses the importance of synergism, or the interaction of ingredients, because the proper proportions help to maximize the nutritional impact of a formula. As with any recipe, if you use the wrong ratios, you will get very different results. With quality ingredients working synergistically with one another, you can be certain that you're providing the very best for your companion animal. Not all pet food manufacturers have your cat's best interests in mind. Unfortunately, many pet food companies use ingredients that you would never knowingly feed your cat. Some intentionally attempt to mislead you with clever marketing, touting ingredients that sound appealing to you but are not actually suited to the nutritional requirements of cats or dogs. 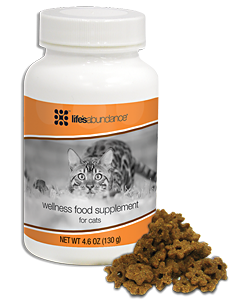 At Life's Abundance, they focus on what felines and canines truly need to help ensure a lifetime of good health, rather than on making the cheapest possible product that might not fulfill your cat's dietary needs. 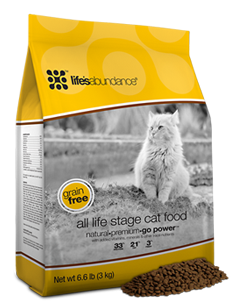 Life's Abundance premium cat food recipe features safe and wholesome ingredients. But for a cat food to be considered truly exceptional, Life's Abundance believes it must meet several specific nutritional criteria. Not only should a cat food score well on the majority of eight distinct measures, it must score well on every measure. Even if one area is overlooked, you could be compromising your cat's chances for wellness and longevity. an array of vegetables; and fruits. Furthermore, to minimize health risks, no wheat or wheat gluten or corn or corn gluten-based products should be featured. If your current food doesn't score well on every single one of these eight distinct measures, we strongly suggest that you feed your beloved feline Life's Abundance. Even though the quality and variety of ingredients provide insight to the strength of a food's formula, they shouldn't be your only consideration when choosing the right food for your cat. In fact, the process by which the food is made is equally vital. Life's Abundance premium dry health food is prepared by a family-owned, third-generation pet food maker, where creating a high quality food is not only a priority and a family tradition, it's an art form. Batches of food are produced in limited runs on a weekly basis, minimizing periods of storage and helping Life's Abundance to deliver the freshest-possible product to your front door. When you pick up a bag of cat food from a retail store, it's impossible to know the history behind the product you're holding. You don't know how long it's been on the shelf, or how long it lingered in the storeroom before being placed on the shelf. You don't know how long it was stowed in a shipping container, subjected to temperature extremes. You don't know how long it was stockpiled in a distribution center prior to shipping. In fact, many mass-produced cat foods are stashed away in tractor trailers without any form of climate-control for weeks, even months. And, you have no idea if proper handling of bags and pest-control are priorities for the packaging centers and warehouses where the product is bagged and stored. Why does it matter that you can't know the history of the retail product? As you might correctly guess, the way a cat food is stored can directly affect its nutritional value and safety. The bottom line is, just because it's store-bought doesn't mean it's fresh. At Life's Abundance, they do not leave factors that impact safety and quality to chance. Their commitment to providing your cat with a superior food goes well beyond the formula and the individual ingredients. To ensure the safety and quality of the final product, they exercise control, from preparation to packaging to storage. As I mentioned before, Life's Abundance Premium Health Food for Kittens and Adult cats is prepared in small batches on a weekly basis. 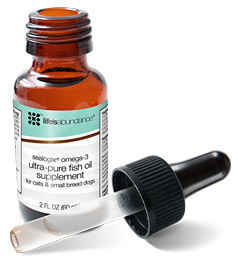 Life's Abundance test the quality of their foods to ensure the integrity of ingredients and to make sure the formula is adhered to. Immediately after each batch is prepared, it's bagged and shipped directly to one of our three warehouses. Life's Abundance shipping departments take pride in the speedy yet careful handling of their products. When you place an order, your cat food is shipped via UPS, FedEx, or USPS, with an average transit time of two - three business days. Thanks to their strict adherence to quality and safety, they've created a streamlined process that, in most cases, means that the food that's delivered to your door is only four to six weeks old. While this comparison is by no means comprehensive, Life's Abundance offers this service as a way to start your quest for the best food for your cat. As a caring pet parent, they expect that you'll have questions. And they are ready to provide answers. As an existing or potential customer, you have toll-free access to their expert customer support staff, Monday through Friday from 8:00 a.m. to 7:00 p.m. Eastern Time. Additionally, Dr. Jane conducts bi-weekly conference calls, providing an open forum where you can put questions directly to Life's Abundance pet product formulator. These calls also include in-depth discussions about her formulas, the superior ingredients they use and other helpful pet-related information. The Life's Abundance team is ready to assist you to the best of our abilities. Dr. Jane Bicks is defined by her absolute dedication to the health and happiness of companion animals. One of the nation's leading natural veterinarians, she serves as Life's Abundance pet product formulator and as the driving force behind their commitment to improve pet health. When you feed your cat Life's Abundance, you will be providing a cutting-edge formula, created to help maintain the health and increase the longevity of your feline or canine companion. Life's Abundance contributes a portion of their proceeds to the Dr. Jane Foundation. The Dr. Jane's Foundation is a non-profit organization absolutely committed to supporting a variety of animal rescue groups, all of which are dedicated to helping to rescue neglected and unwanted animals. Life's Abundance offers very high-quality foods --- at a reasonable price (comparable to other high-end fixed-formula foods). Cats and dogs thrive on the nutrient rich food. In fact, I believe in this cat food so much everyone who exclusively feeds Life's Abundance cat food will receive a 5 year health/genetic guarantee on their kitten. We also use and highly recommend NuVet Plus vitamin and mineral supplement and Life's Abundance Daily Nutritional System for Cats. Have your cat take the taste test, you will never turn back. Their popular cat treat has a new name, a new look and an improved formula. If your cat enjoyed Life's Abundance Natural Cat Treats for healthy skin and coat, they will find these tasty treats absolutely irresistible. Most cats spend a good portion of their waking hours grooming themselves and often loose hair is swallowed, which can lead to an accumulation in the stomach. 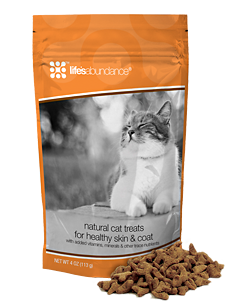 Dr. Jane Bicks DVM, believes that healthy skin and a strong, resilient coat begin on the inside and that is why she formulated Life's Abundance Natural Cat Treats For Healthy Skin and Coat. These savory nuggets are feline-friendly, and they feature a deliciously appetizing flavor that will delight even the most finicky of cats. Healthier hair can minimize hairballs. Made in the USA. Life's Abundance uses a “fast-cook” process at low temperatures to help preserve the nutritional value of each and every wholesome ingredient. And Life's Abundance maintains strict inventory controls to ensure the quality and safety of our foods. Made in the USA. A premium, grain-free diet is formulated for all life stages. Packed with nourishing, high-quality ingredients, this delicious food is perfectly balanced with all of the proteins, omega-3s, vitamins, minerals and other important nutrients pet kids need to thrive … without the grains. Made in the USA. 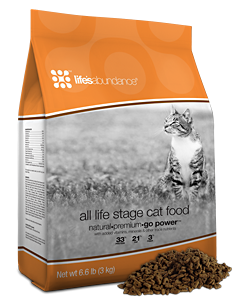 Life's Abundance believes there's no surer way to add more quality years to your cat's life than through amazing daily nutrition … nourishment that begins with Life's Abundance Instinctive Choice Cat Food. Even though cats have been thriving on this recipe for more than a decade, this all life stage food remains a revolutionary formula because it provides sustenance that's modeled after the way cats have eaten in the wild for millennia. Evolved from big, desert-roaming predators who acquired fluids primarily from prey, domesticated house cats still have weak thirst drives to this day. That's why this premium canned food has added moisture content, to adequately hydrate the body and help support healthy urinary functions. A premium food can go a long way towards preserving health. But if your cat or kitten has additional needs, they should be addressed. Stressors such as environment, multi-cat households, lack of exercise, previous injuries and age can intensify health issues, putting your pet kid at-risk for future troubles. NOT GRAIN FREE - This product contains ground brown rice and rice flour.